In what is by all accounts a pathetic bid for social currency, Mitt Romney's campaign has officially become the first political campaign to buy a trending topic on Twitter. 1. Romney 2012 fears that, come Thursday night—which is the last night of the RNC and when the trending topic is set to go live—the GOP nom's campaign will still need an added boost to achieve social relevancy. 2. Mitt Romney is patently unaware of how trends work—which is organically, not by the dollar. 3. 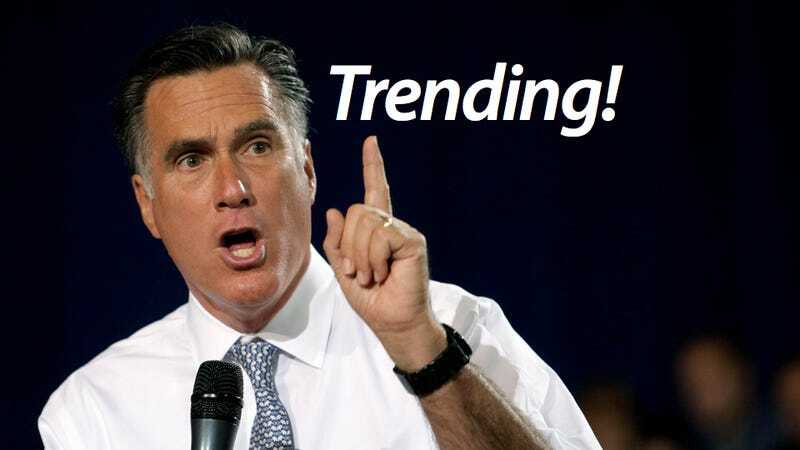 Mitt Romney really likes Twitter and wants to set a trending topic precedent in his bid to become president .